A Greeting of Shalom to All! Let me start my (this) message in this noble gathering by sharing my humble story and reflection while. 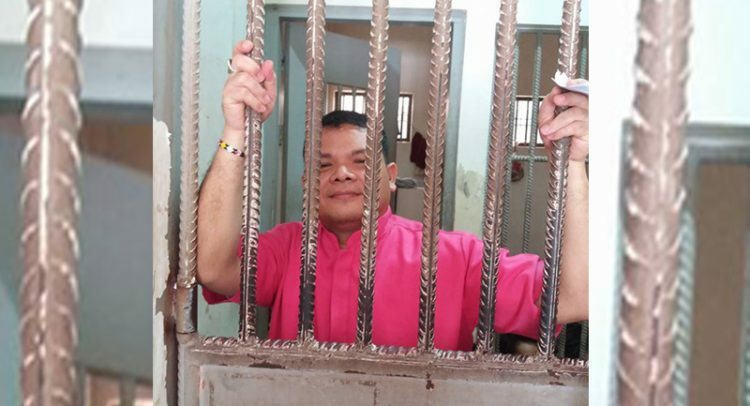 On May 17, five days after our incarcerations in those smelly, hot, crowded Police detention cell, we are brought and committed to the city jail of Ozamiz. After the processes in their office and almost an hour of being expose by the judgmental eyes of the inmates we are guarded by the Warden and several jail officers to the newly open jail being considered as a “High Profile” detainees, Rommel Salinas-the one who flagged as down and hitch for a ride- and 13 others. With the friendly word of the Warden, he allowed us to have ceiling fans for a good room ventilation and TV, surely that can alleviate the boredom feeling in the prison. However, the goods came after 6 days (May 23), when the congregation of Jimenez and the clergy and staff of the Diocese of Siargao lead by Bp Tagud in their visit has graciously brought us the items as they knew our simple plea. We became busy at that time. A group of 5 volunteered for the installation of the TV sets, look for a piece of wood and other materials in order to position it above the door. The other 4 were busy installing the ceiling fan, looking for the manuals and fixing the item. Works are easy later we all realized that we are in need of screw driver/ hammer/saw/wires/electrical tapes and others. At the end, we must request for the warden’s help for him to open the jail bodega for the solution of our request. Life indeed is not simple that we sometimes think we can carry on. Life is not just like the installation of the ceiling fan that instructions and parts are at hand. Moreover, my life in jail overwhelmed with difficult moment, but are still hopeful that in the next days I overcome these mess and your effort is the great reason. My heart was full of joy upon knowing the information by Bp Tonio, Bp Lolong and Darling that the group for Free Bishop Carlo movement will be meeting and having plan for the series of activities this month of August. This meeting I believe paint the color of courage and toughness for my freedom from jail out from those malicious accusation and fabricated charges orchestrated by the state forces. Your effort for my release from this mess shows another episode of our history that no one has a monopoly for the ministry, for development, but in our collective effort we can protect life, and can stabilize peace. Today, we are inspired to stand on our Christian identity. We are expected to be with and in solidarity with the oppressed and marginalized. We are challenged to work with other groups whose agenda is for a genuine peace and justice. Much that we have now a leader who cling to the advises of his militarist and oligarchs cabinets. A president who makes better his loud mouth that echoed the dictates of his advisers: to bomb the Lumad schools, instead of protecting them from military and paramilitary group who have duties in securing the implementation and operation of the foreign-led mining and agro business industry, insisting for the extension of Martial Law and on aerial bombardment that destroyed Marawi and spawned 500,000 and more refugees. The victims of drug war that justified the killings of anyone merely tagged as addict or a pusher, but not looking for the resolution of the crippling the big drug syndicate network, the stoppage of the peace talks with the revolutionary movements and launching another insurgency war, instead of addressing the root causes of war. We look for the president’s promise of change: the socio-economic reforms and political reforms that require the president’s political will to control the resistance of the oligarch and political dynasties to fundamental change. However, the president has out of control on his cabinet, they control him and his peace policies and effort. These are the Christian challenges – a peacemakers challenge, my challenge, our challenge. A challenge that requires faithfulness and perseverance whatever it costs- comfort or even life. Nevertheless, thank you very much for the concern for my freedom. Thank you for offering your time and effort to work for my liberty. Our God bless your plan, He sanctifies us as we do.